Every Thursday during the season, NHL.com fantasy hockey correspondent Justin Goldman, a regional goalie scout for USA Hockey and founder of The Goalie Guild, will provide you with in-depth goalie analysis. From updated weekly top 30 rankings to trending players and more, Goldman will be your go-to guy for fantasy goalie advice all season long. Since 2010, due to factors like sheer skill, injuries and better goalie coaching in the minors, the overall usage of rookies and backups has been steadily rising. Last season was a great example, as a large class of 26 rookies posted a cumulative .912 save percentage (6,089 saves on 6,676 shots) and played in 20.7 percent of the NHL's total games (254 of 1,230). 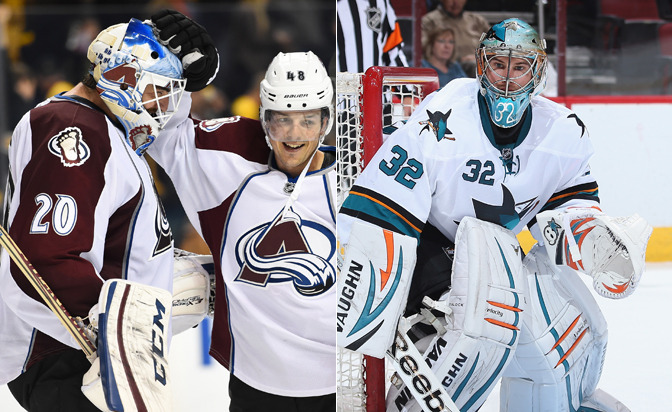 This season may be no different, as 21 teams have already used both goalies, including four rookies. One reason why backups earned so many minutes in Week 1 was due to a full slate of 15 games on Saturday, which made the entire weekend a great sampling of how teams may split workloads. As of Thursday, 16 back-to-back sets have already occurred, with starting goalies going 8-7-1 with a .902 save percentage in the second game. A goalie played both games three times, going 1-2-0 with a .890 save percentage. Of those 16 tail-end games, 12 of them saw the goalie face more shots than the previous night. That's no surprise, but it may encourage a strategy where it's more advantageous to play the backup on the first night and then the starter/"hot" goalie in front of a tired team on the back end. Either way, plenty of backups are already proving their worth in the early stages of the fantasy season. Reto Berra of the Colorado Avalanche, owned in just two percent of Yahoo fantasy leagues, is one backup that has not only made significant improvements to his technique over the summer, but could earn upward of 30 starts. Not only did he stop 123 of 132 shots in four preseason games (.932 save percentage), but he also earned Colorado's first win of the season with a 27-save effort against the Boston Bruins back on Monday afternoon. Alex Stalock of the San Jose Sharks, owned in 32 percent of Yahoo fantasy leagues, already owns their all-time shutout streak (178:55). But he helped San Jose earn a new piece of NHL history when he posted a 30-save shutout against the Winnipeg Jets in his first start of the season. It was the sixth time a team had posted consecutive shutouts to kick off a season, but the first time it happened with two different goalies. Considering the Sharks have seven of their next nine games on the road and two more back-to-back sets in October, Stalock could be an upgrade over other backups on your roster. Although these are very preliminary numbers in relation to an entire season's worth of data, it appears coaches are very aware of situations in which their team may need a boost from a rested goalie, and that will heighten the value and importance of backups and rookies across the League. 1. Darcy Kuemper, Minnesota Wild: After a lengthy contract situation was finally resolved during the preseason, Kuemper became the youngest goalie in NHL history to post consecutive shutouts to kick off a season, stopping all 46 shots Colorado fired his way in a home-and-home sweep. 2. James Reimer, Toronto Maple Leafs: It didn't take long for Reimer, who made the switch from Bauer to Vaughn pads over the summer, to push his way into a rotation. Despite leaving a game early due to injury concerns, he's still 2-0-0 with 46 saves on his first 50 shots. 3. Frederik Andersen, Anaheim Ducks: By winning his first three games and stopping 77 of his first 83 shots (.928 save percentage), Andersen's strong start led Anaheim to send John Gibson to Norfolk of the American Hockey League for a pair of weekend games. 1. Henrik Lundqvist, New York Rangers: Last season, Lundqvist was slow out of the gate, going 1-3-0 in his first four games with an .879 save percentage. This year is more of the same, as he is 1-2-0 in his first three games, allowing 14 goals on 76 shots. 2. Mike Smith, Arizona Coyotes: After a 7-4 win over Edmonton on Wednesday, Smith (1-1-0) has allowed 10 goals on his first 54 shots, an .815 save percentage. This is similar to a somewhat leaky start last season, where he gave up 18 goals in his first six games. 3. Jonathan Bernier, Toronto Maple Leafs: There's never a shortage of pressure in Toronto, and after allowing 10 goals on his first 85 shots (an .882 save percentage), Bernier is already feeling the heat. October is his worst month career-wise, as he's only 7-13-0 overall with a 3.15 goals-against average and .903 save percentage. Karri Ramo and Jonas Hiller, Calgary Flames: Many analysts had little confidence in this tandem heading into draft season, but each goalies has had a stellar start. After a 49-save "steal" on the road against the Chicago Blackhawks, Hiller has faced the most shots (121) in the League and is carrying a .934 save percentage. Ramo has matched that .934 number by winning his first two games against the Nashville Predators and Edmonton Oilers, stopping 57 of 61 shots. These modified re-rankings are a projection of a goalie's fantasy output for the entire season. Our rankings are based on volume categories like games played, wins, saves, goals-against average (GAA) and save percentage (SV%). It is important to note that our rankings reflect sheer fantasy value, not talent. A less-talented goalie could be ranked higher due to his team's strong defense and offense.